to a $100 million taxpayer gift to Warren Buffett, Johnston puts a face on all of the dirty little tricks that business and government pull. 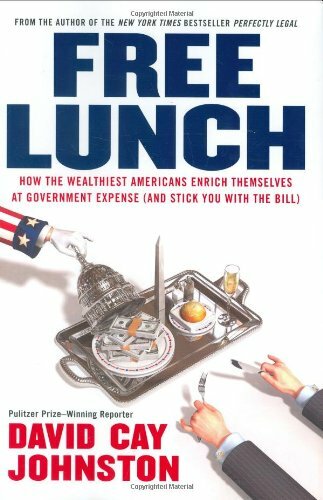 A lot of people appear to be getting free lunchesbut of course theres no such thing as a free lunch, and someone (you, the taxpayer) is picking up the bill. Johnstons many revelations include: How we ended up with the most expensive yet inefficient health-care system in the world How homeowners title insurance became a costly, deceitful, yet almost invisible oligopoly How our government gives hidden subsidies for posh golf courses How Paris Hiltons grandfather schemed to retake the family fortune from a charity for poor children How the Yankees and Mets owners will collect more than $1.3 billion in public funds In these instances and many more, Free Lunchshows how the lobbyists and lawyers representing the most powerful 0.1 percent of Americans manipulated our government at the expense of the other 99.9 percent. With his extraordinary reporting, vivid stories, and sharp analysis, Johnston reveals the forces that shape our everyday economic livesand shows us how we can finally make things better.